Hezbollah Secretary General Sayyed Hasan Nasrallah confirmed on Friday that the party will send more troops to Syria's Aleppo where a major battle goes on in order to defeat the takfiri-terrorist project backed by Saudi and the US. Nasrallah would add that the US and its regional allies were preparing to flood Syria with thousands of additional terrorist proxies in a bid to seize Aleppo. He also pointed out how the so-called "ceasefire" was used by various US-Saudi backed terrorist groups to retrench and prepare for the next phase of fighting. 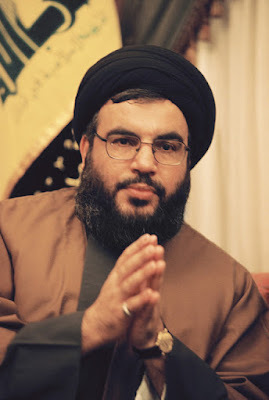 In 2007, Nasrallah would give an interview to Pulitzer Prize-winning journalist Seymour Hersh in his article "The Redirection: Is the Administration’s new policy benefitting our enemies in the war on terrorism?" He believed that attempts would be made to drive Shia'a from Lebanon and Syria as far as southern Iraq, which may explain why the self-proclaimed "Islamic State" (ISIS) finds itself operating conveniently in both Syria and Iraq, serving as a tool to influence not just Syria, but the entire region geopolitically. In essence, Hersh's research and interviews revealed that even as early as 2007, the US was working together with regional allies like Saudi Arabia to bolster armed terrorist groups and their political networks, including the Muslim Brotherhood, in preparations to divide and destroy the region, including Syria, as well as Lebanon. Prominent clearinghouses for Washington talking points, dressed up as journalism like the Daily Beast, have insisted that Hezbollah's fight in Syria is divorced from the organization's alleged purpose - which the Daily Beast claims simplistically is "fighting Israel." In its article, "Hezbollah Fighters Are Fed Up With Fighting Syria’s War," and in typical Western "journalistic fashion," the Daily Beast defers to a handful anonymous anecdotal tales to bolster an otherwise baseless premise promoting this factually flawed narrative. Hezbollah's purpose for existing is not to "fight Israel." It is to protect the nation of Lebanon and the people of the Shia'a faith from all threats. 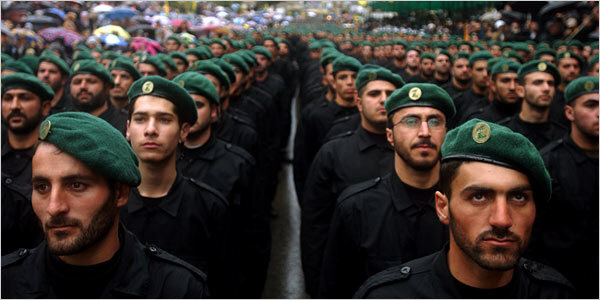 Hersh's 2007 article would reveal that in addition to protecting Shia'a populations, even former CIA operator Robert Baer would admit that Hezbollah would also play a primary role in protecting other minorities across the region, including Christians, when Washington's Al Qaeda-led proxy war began. 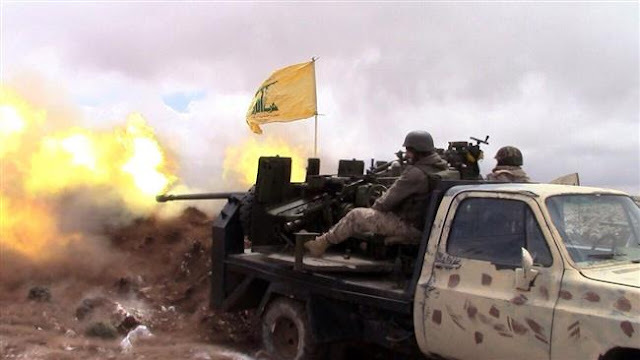 Since Hezbollah's actual purpose for being is the defense of Lebanon - it is not difficult to see why it has invested itself so heavily in the war raging in neighboring Syria. The belligerence of Israel's current regime is only one of many threats that loom large over Lebanon's future. The expansion of extremist groups ranging from Al Nusra and Al Qaeda, to the Islamic State, fueled by US, Saudi, Turkish, Qatari, and Jordanian cash, arms, and political backing, is another. It constitutes an existential threat not only to Syria, but to its neighbors including Lebanon. Lebanon, in fact, has served as one of many conduits through which the US-led proxy war's fighters have moved along with significant amounts of material support. This has led to clashes within Lebanon itself between extremist groups and both Hezbollah and the Lebanese military who attempted to interdict the flow of men and materiel. But the current impact of Syria's war on Lebanon is only one threat the nation and its defenders face. The other is the prospect of Syria's government collapsing and terrorist groups bolstered by the West and its regional allies prevailing - and then spreading. Libya is a Warning to Syria's Neighbors: "You're Next"
As seen in Libya, the Western-induced collapse of a government and subsequent regime change is only the first step of the West's wider ambitions. Libya was then used as a springboard to send fighters and weapons to other nations targeted by Washington for "regime change." This included Syria itself. Observers of the Syrian conflict may recall that in late 2011 and early 2012, Libya contributed a significant number of fighters and weapons to the Syrian conflict, entering the country via NATO-member Turkey with the assistance of the United States government, and spearheading the invasion of Syria's largest city Aleppo. Abdulhakim Belhadj, head of the Tripoli Military Council and the former leader of the Libyan Islamic Fighting Group, "met with Free Syrian Army leaders in Istanbul and on the border with Turkey," said a military official working with Mr Belhadj. "Mustafa Abdul Jalil (the interim Libyan president) sent him there." It should be noted that US-backed terrorist leader Belhadj is now rumored to play a pivotal role in ISIS' presence in Libya. Syrian rebels held secret talks with Libya's new authorities on Friday, aiming to secure weapons and money for their insurgency against President Bashar al-Assad's regime, The Daily Telegraph has learned. At the meeting, which was held in Istanbul and included Turkish officials, the Syrians requested "assistance" from the Libyan representatives and were offered arms, and potentially volunteers. "There is something being planned to send weapons and even Libyan fighters to Syria," said a Libyan source, speaking on condition of anonymity. "There is a military intervention on the way. Within a few weeks you will see." 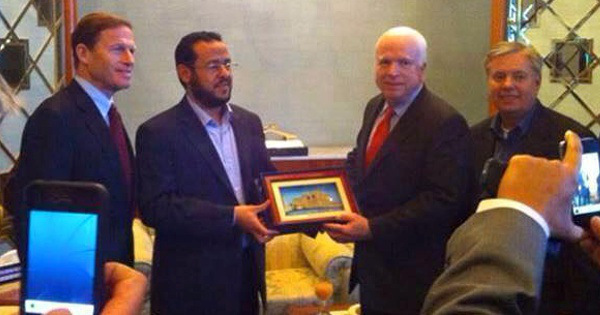 Image: It is no coincidence that US-backed terrorist Belhaj would immediately marshal Libyan fighters and weapons to wage America's proxy war in Syria after the fall of the Libyan government in 2011. Meanwhile, residents of the village where the Syrian Falcons were headquartered said there were fighters of several North African nationalities also serving with the brigade's ranks. 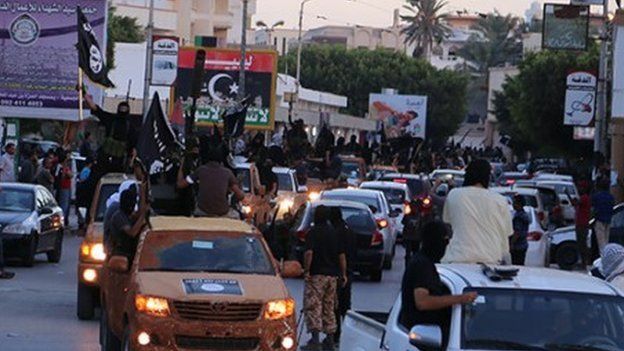 A volunteer Libyan fighter has also told CNN he intends to travel from Turkey to Syria within days to add a "platoon" of Libyan fighters to armed movement. With this all in mind, one can only imagine how much greater the reach of these terrorist groups will be with Syria as yet another hub to train, stage in and traffic weapons and fighters from, as the West shifts its proxy war toward Lebanon, Iran, and even as far as southern Russia and western China. Lebanon, without Syria's government and military, and with Iran fighting a proxy war that will inevitable cross over into its territory should Syria fall, does not stand a chance against proxies backed by US-led multinational sponsorship of terrorism. 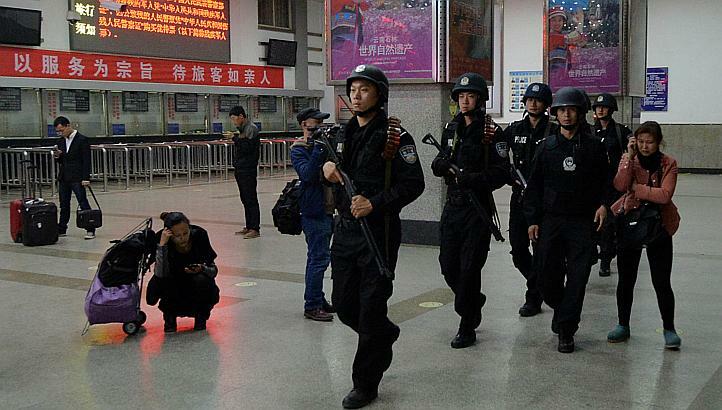 Image: Police patrol in western China where US-backed terrorism actively seeks to undermine peace and stability in a bid to destabilize Beijing. Syria's fall to US-backed terrorists will enhance America's ability to project wider terror, further, including China. Syria's battle is Lebanon's battle. It is also Iran's battle, as well as Russia's and even China's. These nations do not support and defend the Syrian government out of an obligation to an ally alone. They do so with the realization of where the conflict will lead to later if not ended in Syria now. This is precisely why Syria, Russia, Iran, and Lebanon - and to a lesser extent, China - cannot afford to abandon Syria. This is also why "assurances" from the US that if only "regime change" is accomplished in Syria, the conflict will end, cannot and should not be entertained. "Regime change" did not end the conflict in Libya, nor Libya's role in supporting wider conflicts beyond its borders. It will not end in Syria either. It will only lead to the next, and much larger conflict. Hezbollah is not fighting for "Assad" in Syria. Hezbollah is fighting for Lebanon and the stability of the entire region upon which Lebanon's future depends.